Better than a treehouse: trees made of houses! 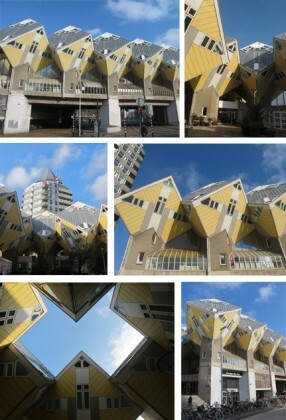 That’s the crazy idea that ran through the head architect Piet Blom when he gave birth to these cubic houses. Located in the center of Rotterdam, near the future giant hall which will be star attraction of the city in a few months, the cubic houses form a kind of forest with forty units. Built in 1984, these cubes are inclined at an angle of 45° and offer a different way of life in the city. You can visit one of these homes to better understand the difficulties that people are having, trying to furnish these atypical and angular spaces! But also to enjoy the comfort of living with your head in the clouds, as though you were in a tree. Built in 1984, the houses were way ahead of their time. Today, even if the design is slightly outdated, they are still standing proud. And they single handedly illustrate the architectural creativity in a city where anything is possible!